Too often, students with ADHD (attention deficit hyperactivity disorder) get labeled as "problem students." They often get shuffled into special education programs even if they show no signs of developmental disability. Though these students' brains do work differently, studies prove that it doesn't preclude them from being highly intelligent. That means teachers should pay special attention to help students with ADHD discover their potential and deal with the challenges they face in their learning process. 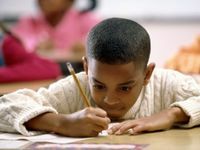 As essay writing is both the most common and the most complicated assignment for students, writing instruction for students with ADHD requires special efforts. Each step of writing process may present certain difficulties for these young people. Here are some practical solutions for teachers to encourage, motivate, and focus their students on writing process. Research proves that ADHD doesn’t result in less intelligence, but rather in difficulties controlling emotions, staying motivated, and organizing the thoughts. So a teacher's first task is teaching students focus enough on a writing assignment. Solution: Give clear, concise instructions. Think about the last time you felt happy and joyful. Describe the reasons for your happiness. What exactly made you feel joy? What can that feeling be compared to? Make sure every student knows that he or she should come to you directly with any questions. Plan to take extra time reviewing the instructions with students one to one, writing down short instructions along the way. Several studies have found that students with ADHD struggle with organizing their thoughts and mental recall. These students can often speak well and explain their thoughts orally, but not in writing. Solution: Get them organized from the start. Start each project with a simple note system. Give students the freedom to take their own notes and review them together if possible. Have students pay special attention to filing these notes in a large binder, folder, or other method for making storage and retrieval simple. To help students understand how to organize their written thoughts, teach them mind mapping. A semantic mind map for an essay may include major nouns, verbs, and adjectives, as well as phrases to use in writing each paragraph. Some introductory and transition sentences will also come in handy. Another step after mind mapping is advanced outlining. Begin and end the initial outline with the words "Intro" and "Conclusion" as placeholders. Then have students expand that outline on their own. ADHD can make it difficult for students to focus on long-term goals, leading to poor attention and concentration when the task requires work for an extended period of time. Solution: Create small, manageable milestones. Since accomplishing a five-page essay takes a lot of time, you can chop it into smaller, easier-to-manage pieces that can be worked on in rotation. Each piece may be checked separately if time allows. Treating every issue and section as an independent task will prevent students from feeling overwhelmed as they work toward a larger goal. Deadlines are the things that discourage students with ADHD, as they work on assignments more slowly than their classmates, are often distracted, and tend to procrastinate. It may sound ridiculous, but build procrastination into the writing process by breaking up the work and allowing for extra research, brainstorming, and other activities which diversify students' work while still focusing on the end result. Students with ADHD often have difficulties with writing, especially in terms of spelling. The most common issues are reversing or omitting letters, words, or phrases. Students may spell the same word differently within the same essay. That's why lots of attention should be paid to spelling. Solution: Encourage spell checkers, dictionaries, and thesaurus. There are plenty of writing apps and tools available to check spelling and grammar. As a teacher, you can introduce several apps and let students choose which ones work better for writing essays. When checking the submitted papers and grading the work, highlight the spelling mistakes so that students can pay special attention to the misspelled words and remember the correct variant. Students with ADHD may experience problems during the final editing of their work since, by this time, they will have read and reviewed it several times and may not be paying attention to mistakes. Solution: Teach them to review their writing step by step. Take an essay template as an example and show students how to revise it. Go through the editing process slowly, explaining the "why" behind certain changes, especially when it comes to grammatical issues. Assign students the task of revising each other's essays so that when they revise their own final draft, they'll know what to pay attention to and what common mistakes to look for. Addressing the challenges unique to students with ADHD will help these students find ways to handle their condition effectively and even use it to their advantage. Their unique perspective can be channeled into creative writing, finding new solutions to problems, and most of all, finding, reaching, and even exceeding their goals and fulfilling their full potential.